AMERICAN CANNONS produces as well as markets black powder cannons to be used primary for display & salute firing purposes. Our newest line of cannons is designed and built to be used in competition shootings, or on ranges involved in the Upcoming Sport of Golf Ball Launching. These cannons feature stainless steel removable screw-in barrels in 12", 15" or 18" barrel lengths that are designed to fit into one receiver. Therefore, allowing different shots at different distances without having to purchase another complete cannon. Simply unscrew the barrel and choose your desired size. 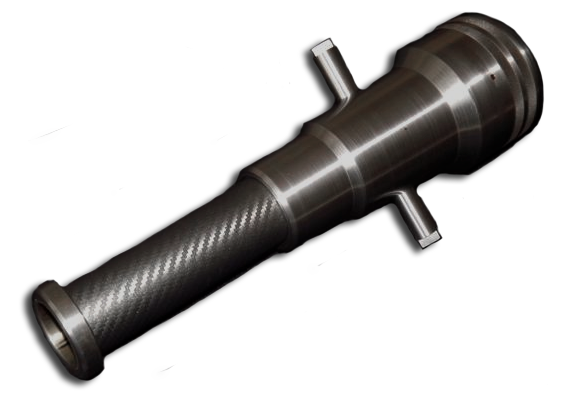 Our cannons are CNC machined from 4" diameter solid T1080 High Carbon Steel. They require little maintenance other than normal cleaning after using and keeping a high quality oil film coating on the metal. Always remember it is best to store the cannon with the barrel fully screwed into the receiver and don't forget to use anti-seize on the threads for easier disassembly. Our Barrels are made of stainless steel. WHO WE ARE: We are a newly formed company created under the banner of Boyer Enterprises which has roots deep in the sporting goods industry with several claims to patented products developed and/or distributed by such companies as Browning , Bear Archery, PSE, Martin, etc, not to mention licensing and manufacturing agreements with firms such as Uncle Mike's, Butler Creek and Bushnell. Our goal is to bring about and help promote a new and fun sport that we call Golf Ball Launching. It combines the fun of Black Powder from various shooting sports with the skill and distancing of a little white ball known to many as Golf. These cannons have specially designed firing chambers which accept from as little as 100 grains to the maximum recommended load of 550 grains of Black Powder. We have been manufacturing Golf Cannons for several years to private clients who wanted 'something different'. Often for 4th of July & New Years celebrations. Most importantly for use as a Salute for occasional family entertainment. In the process we have learned the pros and cons of combining the two industries in order to make an extremely safe and reliable product; that is actually fun for the whole family to participate in. AMERICAN CANNON'S GOLF BALL LAUNCHERS - JOIN THE EXCITEMENT!